St. George Serbian Orthodox Church - What is Freemasonry? Freemasonry, also called Masonry, was in its modern form born of English Protestantism at the end of the seventeenth century. Here it became very strong in the government, in the military, in business and in Anglicanism, in all of which it remains firmly entrenched to this day. Essentially, freemasonry is a syncretistic movement which promotes the equality of all religious beliefs, world unification and a one-world government under the leadership of its ideology. For this reason it is opposed to the Spiritual Tradition of the Church and believes only in a 'Superior Force' in the Universe. Therefore it rejects the two teachings at the heart of Orthodox Christianity, faith in the Holy Trinity, Three Persons in One Essence, and faith in Jesus Christ, the Son of God become man, not to mention all the other teachings revealed to the Church by the Holy Spirit. Official freemasonry recruits its members, male only, to its 'lodges' (local branches) from the socially successful, especially from the wealthier professional classes, financiers, doctors, lawyers, journalists, businessmen, military officers, the police, the judiciary and local and national politicians, who finance it generously. (2). Freemasonry is said to be especially strong in the world's financial centres, Wall Street and the City of London, and in the world's media and Hollywood. Useful recruiting grounds are paramasonic professional clubs, such as Rotary Clubs and Lions Clubs, which operate under the front of charity, which most of their misled members sincerely believe in. It should be noted that freemasonry only recruits 'important' people, who can influence public opinion and decision-making and have power. It ignores 'the little man', in whom it has no interest. It is said that freemasonry has thirty-three orders or degrees of initiation. It is said that the first degrees are relatively easy to enter, but not the later ones. At each degree masonic teaching is gradually revealed to the initiates. Beyond the thirty-three degrees, there are said to be another sixty-six degrees, which are open only to a chosen few. Beyond this there is the one hundredth degree, at which the 'Superior Force' in the Universe is fully revealed. This is Satan. Almost all freemasons at the early degrees see their lodges as mere social and charitable organisations, clubs, and would vigorously deny the ultimately satanic nature of the masonic cult. But that is because freemasonry exploits their naivety Freemasonry in History Historically, freemasonry has aggressively promoted itself, particularly against Roman Catholicism and the Orthodox Church. This is because it sees them as traditions which frustrate its attempts to create conditions for world unification under its ideology. Thus, in the eighteenth century masons brought about the satanic French Revolution of 1789, which transferred power from the Roman Catholic aristocracy to the ever-greedy and masonically-led bourgeoisie. Many famous people in the France and the Western Europe of the time were freemasons, including Voltaire, Diderot and Mozart. Freemasonry first entered Russia during the wave of enforced Westernisation in the 18th century, under figures like Schwarz, Lopukhin and the journalist Novikov (1744-1818). It was firmly opposed and denounced by St Innocent, Bishop of Penza (1784-1819), who was exiled (and soon after died as a result) by the Minister of Religious Affairs and Oberprocurator of the Holy Synod at that time, a very worldly man called Prince Alexander Golitsyn. (3). Prince Alexander Golitsyn- He was a keen supporter of freemasonry, though it is not clear whether he was actually a mason himself. However, this question is in fact irrelevant, since he certainly implemented whatever the masons wanted of him. Freemasonry then became instrumental in the Decembrist revolt of 1825 in Russia and it is said that a freemason assassinated the Russian writer Pushkin in 1837. In any case, freemasonry went on to become very influential among the Russian ruling class, many of whom lost their faith. Most Russian newspapers before 1917 were under its control, until it engendered the first satanic (and masonic) Russian 'Revolution' of 1917. Unfortunately for the freemasons, they lost control of their movement to a group of opportunists, the Bolsheviks, who brought about the second satanic 'October Revolution', which proved to be anti-masonic. The next masonic lodge in Russia was re-established there only in 1995, though one of the candidates for the recent Russian Presidential election was a freemason. Freemasonry on the Fringes of the Orthodox Church and Renovationism By the beginning of the 20th century, freemasonry was being promoted by the commercial conquests of the British Empire and masonic lodges were opened worldwide. This included in Orthodox areas like Cyprus and the Middle East. It was in Cyprus before the First World War that an Orthodox bishop became a freemason. This was the future Patriarch Meletios of Constantinople, who later, after a series of other scandals, introduced the new calendar into the Orthodox world by force in the 1920s. (4). Patriarch Meletios was notorious for his power-hungry imperialism, by dividing the Russian emigration in France and North America and actually taking over former Russian Orthodox territories in Finland, Estonia and trying to do the same in Poland and Czechoslovakia. In the 1920s he held a modernist congress in Istanbul and also supported the Communist-supported modernists, called renovationists, in Russia against His Holiness Patriarch Tikhon of Moscow and the Church. Thus, he supported those who martyred the martyrs. He found particularly easy prey in Paris among the many masonic Russian aristocrats and wealthier emigres who had emigrated there after 1917. (5). Since freemasonry had become very popular in St Petersburg before the Revolution, together with other pseudo-mystical movements such as spiritualism, Hinduism, Buddhism etc, the emigres took their vain beliefs into the emigration with them. There, Patriarch Meletios' supporters managed to engineer a schism from the Church of the Russian Emigration, a schism that was to be repeated later in North America. It should be noted that the Church of Greece strongly opposed Patriarch Meletios and in the 1930s firmly condemned freemasonry, in the same way as the Russian Orthodox Church Outside Russia. The Contemporary Tasks of Freemasonry As we have said, having brought about the collapse of the Russian Empire in 1917, which it had been infiltrating for some 200 years, freemasonry left Russia to Soviet and later Nazi satanists. It concentrated its attention on eating away at the fringes of Orthodoxy outside Russia, especially in the Middle East, in the Balkans (especially in Romania), in Finland and in the Russian emigration in France. Thus, in Paris, two churches under the Constantinople jurisdiction were, to my knowledge, being used for masonic initiations in the 1970s and 1980s. As for the Russian cemetery at St Genevieve des Bois, many gravestones are decorated with the compasses, the masonic emblem. In one church parishioners openly gave each other masonic handshakes. However, it should not be thought all male members of the Paris Jurisdiction were or are masons. It is simply that many of the key ones were at the time, and others simply went along with the movement. (6). Elsewhere in the twentieth century freemasonry was very successful in undermining some of the remaining Orthodox vestiges in Protestantism. Then it organised the Neo-Protestant Vatican II Council, which successfully destroyed many of the remaining vestiges of Orthodoxy in Roman Catholicism, preparing Western Europe for the atheist European Union. Thus, the secularist movement which freemasonry promoted had huge success during the latter part of the twentieth century. Today its lobbies operate freely within the EU and has opposed recent moves to include any sort of mention of Christianity in official EU documents, notably in the EU Constitution. It can be safely assumed that most senior members of most EU governments are freemasons. Having laid low the relatively easy prey of Protestantism and later Roman Catholicism through infiltration, one of its greatest tasks now is to destroy the Orthodox Church, the unique bastion of uncompromised Christian Tradition. Therefore, the priority for freemasonry today must be to destroy those parts of the Orthodox Church on Mt Athos, in Jerusalem, Georgia, Serbia and, above all, in Russia, which have not yielded so far. Again, the technique used is to eat away at the edges of these countries. Thus, Serbia has fallen victim, losing parts of its territory in Bosnia, East Slavonia, Kosovo and Metochia. Montenegro and Macedonia have been split from it. 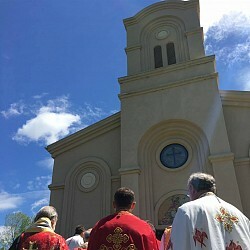 In Russia, the technique is to take over Russian Orthodoxy in the Ukraine, Estonia and to send its renovationist (modernist) agents, clerical or lay, into parishes in Western Europe and North America. Therefore, it is of use to know how the renovationist or modernist mentality can be discerned and how it psychologically manipulates and conditions its naïve, and not so naïve, adepts. 1. Anti-Church Since modernism, the tool of freemasonry, is anti-Orthodox, it is therefore anti-Church. It sees Orthodoxy as just an exotic or primitive form of Roman Catholicism. In order to defuse the spiritual potential of the Orthodox Churches, it therefore attempts to water Orthodoxy down through the syncretistic ecumenical movement. An essential element here is to introduce new calendarism. This is not the same as the new calendar. There are many Orthodox who, in obedience to their bishops and in order to avoid sectarian schisms, accept the new calendar for the fixed feasts, though they would much prefer to live according to the Orthodox, so-called 'old', calendar. On the other hand, new calendarism is a whole psychology, which actually believes that the new calendar is the correct calendar (!) and wishes to introduce the new Paschalia also. So far this has only been introduced into a few parishes in Finland and Slovakia. 2. Anti-Tradition Modernism considers that all sense of the Tradition (Spiritual Truth) must be undermined. In their pride, its half-baked intellectual victims consider that they know better than 2,000 years of the collective spiritual wisdom of the Church. Orthodoxy for them can be reduced to the folklore of the 'ethnic' peasants of Eastern Europe, Greece and the Middle East. Modernism expresses the inherent arrogance and racist condescension towards 'primitive', 'ethnic' Orthodox in the Protestant, Pro-Jewish manner. Anti-Tradition modernism likes to isolate itself from the Local Orthodox Churches in disincarnate groupings, but casts itself as being in the mainstream, maintaining that it is in the vanguard of the Church and that the others, who are simply stupid, will eventually catch up! 3. Anti-Saints As we have said, modernism prefers half-baked intellectuals to others, including to the saints. Lives of the Saints are definitely out of fashion in modernism, although they can be suitably 'edited' and censored (that is dumbed down) for 'the simple-minded'. Having said this, selected passages of some very high-level saints are popular in modernism. These include St Isaac the Syrian, St Ephraim the Syrian. St Symeon the New Theologian. St Nicholas Kabasilas and even St Seraphim of Sarov. The life of the latter has been ecumenically edited among them and the actual Russian life censored. Modernism loves to talk about the heights of spiritual experience (St Seraphim), especially theosis, that is divinisation. This is because it is an abstract, impractical, intellectual movement, which does not show how we can learn to walk before we can run. Thus begin all sorts of spiritual illusions and the naïve victims of modernism are so manipulated, falling into the delusion, 'prelest', of thinking that they are 'spiritual'. The devil laughs at them and their phariseeism. 4. Anti-Monasticism Since monasticism is the bastion of the Tradition of the Church, a source of holiness and the saints, modernism is fiercely opposed to monastic life. Thus, it is for the remarriage of widowed clergy and a married episcopate. For if the episcopate is married, then monasticism lose much of its influence and masonic married clergy can become bishops. In order to do this, modernism is always digging up stories to discredit monasticism and condemning our holy fathers as 'monkish obscurantists'. 5. Anti-Heart As an intellectual movement, modernism remains stuck in the head, it does not enter into the heart. Thus, its often academic adherents suffer from weak, shallow, superficial and limited faith and understanding of the faith. Their books are spiritually flat, empty. Its representatives are sometimes limited to a feeble and castrated pietistic sentimentalism, common in heterodoxy. For this reason modernists are prone to change their views, to adapt to the world, to swim with the tide of social fad and fashion, including political correctness. They lack conviction and spiritual authority and power (Lk. 4, 36), relying on personal 'charm' and 'charisma'. For this reason, modernism has many false smiles, but knowing itself to be weak inside, it is underneath in fact afflicted with aggressiveness, as are all bullies. For this reason it loves to slander and assassinate the characters of the faithful, dismissing them as 'extremists', 'unstable', 'ethnic', 'primitive', or simply 'stupid'. 6. Anti-Prayer Since modernism is intellectual and does not understand that the heart is the centre of humanity, the place of deep prayer, it is opposed to prayer life, which might influence the intellect. Thus, for example, it dislikes preparation before communion, the reading of canons and akathists. Under strong Protestant influence, it likes very frequent communion, but strongly dislikes confession and promotes the practice of 'general confession', completely unknown to the Orthodox Tradition. In reality, although frequent communion is very praiseworthy, it must go hand in hand with adequate preparation, thus forming a virtuous circle. The modernist circle is a spiritually dangerous one. 7. Anti-Fasting Clearly, since modernism places the brain above the heart, thought above prayer, any process which may deepen prayer, for example fasting, is rejected by it. This contradicts the Gospel teaching that this sort can 'come forth by nothing, but by prayer and fasting' (Mk 9, 29). For this reason, modernism discredits fasting, mocking it as a purely alimentary phenomenon. So modernism reveals its disincarnateness, its lack of understanding that the human being is composed of body and soul, and is not just a walking brain. 8. Anti-Services Opposed to prayer, modernism abbreviates the Church services, in which is contained all the theology and teachings of the Church. It actually makes changes to the texts of the services, especially where they relate what some of the Jews did to Christ and the victories of those who triumphed over the heresies of Arianism and Origenism. It derides the use of the Menaia and akathists, with services to the saints, also services of supplication and memorial services. It loves to adopt Protestant customs, filling Orthodox churches with pews or chairs, sometimes even organs. It stresses sermons, not sacraments, preferring frequent meetings to services, stressing the social to the actively liturgical. It detests kneeling and prostrations, it does not wish to light candles, justifying itself by saying that the smoke from the candles will 'darken the icons and frescoes', it also dislikes incense, which frightens it. Rejecting most of the services, it falls back on eucharistic liturgies alone. 9. Anti-Clericalism Since modernism so strongly dislikes the Church services, it opposes also the instruments of the services, that is, the clergy. It dislikes clergy dress, preferring beardless, dog-collared clergy to Orthodox-looking clergy. Therefore, it does its utmost to infiltrate its modernist agents into the clergy and create a new style of clergy appearance, waiting for the people to accustom themselves to this. 10. Anti-Woman Modernism promotes the anti-woman ideology of what it so perversely calls 'feminism'. This demeans the femininity of woman, implying that women must at all costs become like men, even in appearance, through short hair, the wearing of male trousers and not wearing headscarves. Encouraging very frequent communion, it refuses to recognise the monthly problems of women and forces them to come to communion even at this time. It also deprives mothers of the Churching prayers after childbirth, which are intended to combat post-natal depression, dismissing them as 'relics of the Old Testament!' Conclusion The combat against 'liberal', modernist values can only be through the Confession of the Orthodox Faith, if need be, to the point of Martyrdom. Here it is important to identify all the subtle details and psychology of the modernist movement, which is opposed to the Orthodox Faith. It is also important to realise that most modernists and indeed most freemsasons, are not conscious leaders of their apostasy, merely the naïve pawns of modernism and we must pray for their conversion to authentic Orthodoxy. The above Ten Signs of Modernism should alert us to the apostasy from the Church, which is heaven on earth. This apostasy is the aim of freemasonry, in its desire to destroy the Church on earth and enthrone Antichrist in Jerusalem, to create hell on earth. The events of the twentieth century show that hell on earth already exists in certain parts of the world, for modernism has brought the demons out of hell to roam freely over the earth. Our task is to hold back these developments, even sending back demons into hell and reconquering the world for Christ and His Church, until such time as the Lord Jesus Christ comes again in glory.